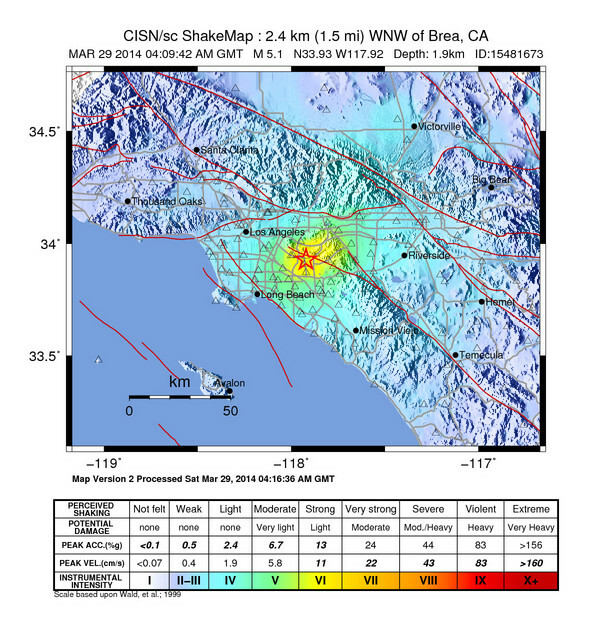 The USGS is currently calling it a 5.1-magnitude earthquake, epicenter near La Habra at 9:09 p.m. It was preceded by a 3.6 quake at 8:03 p.m. There was a 3.4 aftershock at 9:11 p.m., a 3.6 aftershock at 9:30 p.m. and a 2.7 aftershock at 9:45 p.m., according to the USGS. Updates to come. 9:27 p.m. update: There are no reports of damage or injuries on the Metro Rail system. 9:54 p.m. update: Track + equipment inspection on all Metro Rail lines due to earlier #earthquake is complete. No damage or injuries reported.